Tue - Sun: 5:00 pm - 10:30 pm, Closed on Mondays. Birthday PromotionNone for birthday, but there's a student discount. Also does random in-store promotions. 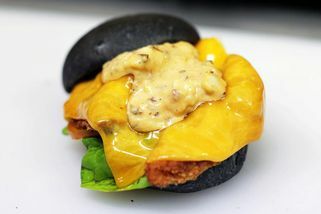 myBurgerLab in Seapark PJ serves gourmet burgers in various shapes and generous sizes, between RM11 to RM18.50. Burgers are upgradable with extra toppings, fries and bottomless soda to fit your stomach. Signature burgers include Say Cheese, Kick in the Face, The Hulk and Chicken & Egg Dilemma. New burgers are constantly being invented in the lab. 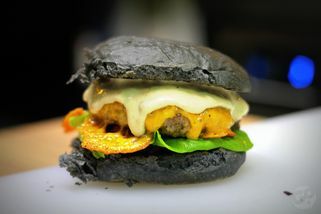 myBurgerLab is open from 5pm onwards; closed Mondays. "ok.lets start. I took the menu A++(..."
Parmesan crisp: got 2 pieces. 1 was ok,the other one was hangit,and it left a terrible aftertaste. its miles better than burger junkyard. at least they get the basic right. at first,i thought they have weird combination, cuz the burger i ate have caramelized onion and 2 types of mushroom. all in all,it was good. i was satisfied with what i get for my rm22, especially with bottomless drink. owh.and i like the environment.minimal decoration give a very clean yet sophisticated look. and the service is awesome.very nice,very polite,very friendly.their burgers might not be top notch,but their service surely is. the portobello was fried with bread crumbs,so very crunchy.